PT630 Advanced Indicator with cables exiting from the back, fitted with UK mains plug and cable. The sloping front panel and rubber feet are ideal for mounting on a desk but the PT630DM can be mounted on a wall, desk or column with optional mounting brackets. 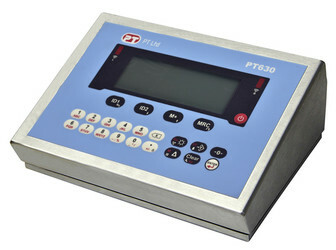 The PT630 can be system integrated with a wide range of fieldbus protocols and has built in filling, check weighing and classifying APPS (requires an option with DI/O). Data Sheet for PT630 Advanced Indicator.